Possibly the EASIEST way to Profit from Betfair! 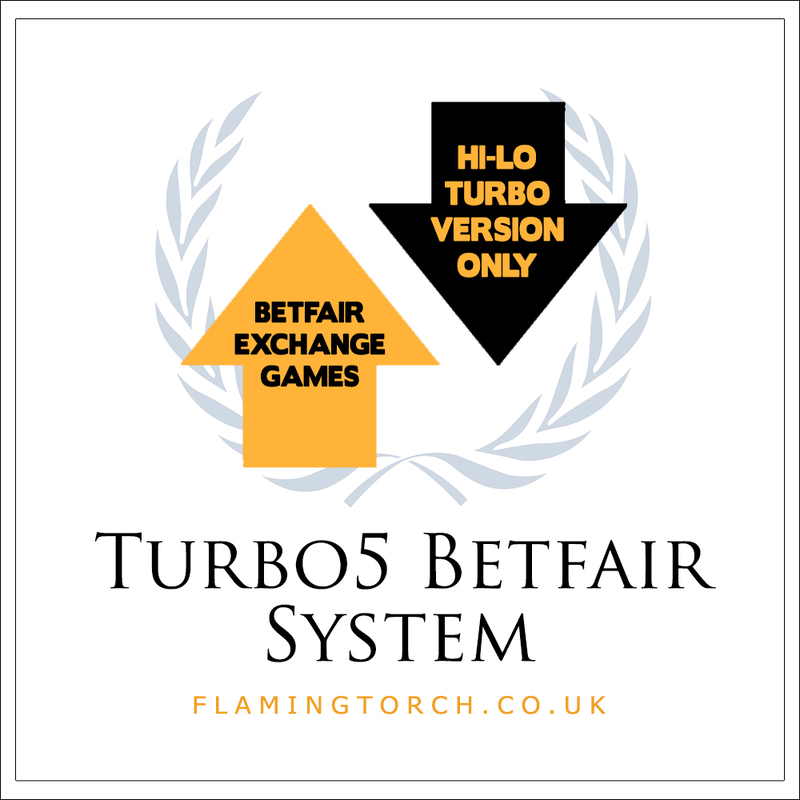 This system uses the Betfair Exchange Game called TURBO HI-LO. Our other Betfair System is different to this one, and must be used on the Standard version of Hi-Lo only. 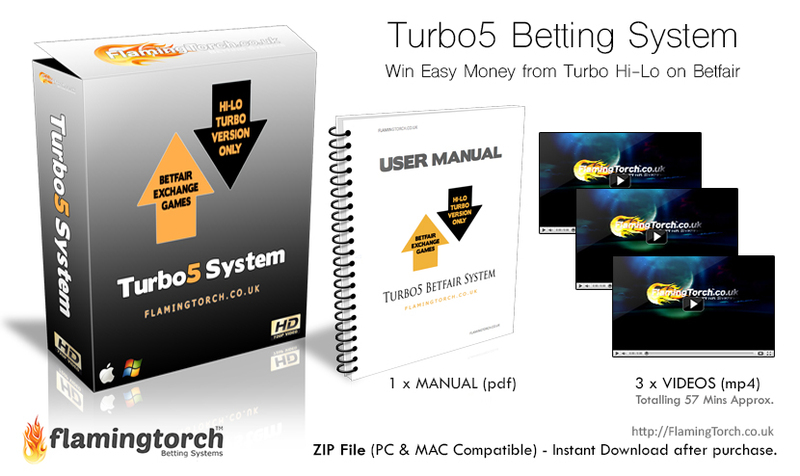 With THIS new Turbo5 Betting System, you can make really easy profits from the TURBO version of Hi-Lo. Win just £11.64 profit a DAY and that’s £349 a Month! Keep your bets small on Turbo Hi-Lo, and it seems to just LET YOU win! Over the years we kept looking at Turbo Hi-Lo. We’ve were pouring over the game data looking for patterns and testing different theories. Ever since this faster version of Hi-Lo came out, we’ve been getting emails about it. Everyone that owned a copy of our original ‘Betfair System’ for Standard Hi-Lo, wanted to know if they can use that system with this Turbo Hi-Lo game. We always told them the same thing – Sorry, but No. You can’t use our original Betfair System with Turbo Hi-Lo for a few reasons, but the main one is the lack of TIME to place your bets during the rounds. With the STANDARD version of Hi-Lo, you have enough time to place the required bets between the rounds, because you get 25% more time. That’s roughly 5 extra seconds with each round. Turbo Hi-Lo looks like exactly the same game as Standard Hi-Lo – BUT, IT’S NOT! They are very similar, and appear the same to the unknowing punter. But Turbo Hi-Lo is not only 25% faster in general, it also speeds UP after card 3 is revealed, giving you even less time as the game goes on (this is confirmed by betfair). When we analysed the game data over many weeks, we saw different patterns between the results playing Turbo Hi-Lo compared to Standard Hi-Lo. Betting strategies that broke even or were profitable on Standard, did not seem profitable on Turbo Hi-Lo. How annoying is it when you’re playing one of the Betfair Games, and it’s going well, until all of a sudden, an unbelievable STRING OF LOSSES occur!? I’m talking about a ridiculously unlikely event, like the dealer getting Blackjack 3 times in a ROW, followed by 21 with 5 cards, then getting a 20 when his up card was a 6, followed by five more 20’s in a row and a Blackjack again to top it off. Or with Roulette if you’re betting Red every time, you suddenly get 15 or 20 Blacks in a ROW. The SECOND you switch to betting on Black, a RED number comes up. It’s as if Betfair has a CHEAT BUTTON they press after a while, which just does WHATEVER IT TAKES to make you lose, no matter how unlikely the event may be. They always let you WIN a bit first, to lure you in. Then WHAM! They hit that button! True or not, who knows for sure, but that’s how it feels with a lot of their games sometimes. Turbo Hi-Lo is an Exchange Game, which means it’s a COMMUNITY GAME. I’m sure you know this already, but incase you don’t, it means we all see the SAME GAME if we’re playing at the same time. The exact same cards will come up on your screen, and everyone elses screen. Betfair DON’T CARE who wins or loses – because they take a 3% commission from all winnings. When you win, you win money for the punters that lost in that game (not from betfair). When you lose, the punters that won in that game get your losses (not betfair). The game is played by the computer, that plays a perfect strategy according to probability. THIS MEANS THE GAME HAS TO BE FAIR AND CAN’T SCREW YOU OVER IN PARTICULAR. We just have to decide on what to bet on. Something likely to happen with low odds, or something unlikely with higher odds. The key thing for us was to find a method/strategy that was profitable on TURBO Hi-Lo, both short term AND long term. It also had to NOT rely on placing bets DURING the game (due to the lack of time). Then finally, one of the methods we were testing hit positive for everything we were looking for. This became our Turbo5 System. We’ve called this system Turbo5 because it’s designed to win lots of £5.00 profits from Turbo Hi-Lo. In reality, each time you win a session, you will actually win £6.00. However, betfair will take 3% commission on that win and so you’ll win £5.82 PROFIT each session. It can win that £5.82 profit VERY QUICKLY. Many times you will win that in under 5 minutes. This system works by following our specially designed Betting Chart to placing a couple of small bets at the start of a new game, before the Start Card is turned over. We let the game run and finish. What action we take next depends on what our betting chart tells us to do, based on how much we won or lost on that game. We NEVER bet during the game (between rounds) with this system. At the end of a session you will have won £5.82, or lost £11.64. If you have a losing session, you can recover from it quickly with just TWO winning sessions. Winning sessions are VERY LIKELY to happen, and losing sessions are unlikely. We bet on something that occurs A LOT – on average, 26 times out of every 30 games. Most of the time you can open Turbo Hi-Lo at any time of the day or night, follow the system, and win a session in under 5 minutes. This is why we compare it to having a virtual ATM – we can get easy £5.00 wins from it anytime we like. NOTE: This system is NOT based on our other Betfair System – this system cannot have any big losses and it doesn’t involve any betting during the games (after the first card is turned over). To some people, £5.00 wins doesn’t sound like much. Even though you can have loads of them, whenever you want, with very little chance of losing! But remember, we are only betting small amounts! We do this to ensure our bets will always get matched. It also keeps any potential losses to a minimum, and it means we can ‘fly under the radar’ when it comes to Betfair monitoring how much any one particular account is winning. If you only win small amounts, Betfair don’t seem to care – they almost LET YOU win. It’s possible to win £349.00 in a month – if you just win £11.64 a DAY! (two sessions a day). Let’s get realistic and assume you don’t want to play every day, and you don’t want to play for long. So let’s say you just play 5 days a week and only aim for ONE SINGLE WINNING SESSION per day. That would still equate to £116.40 per month (£1,396.80 per year!!) – and that’s hardly using it! 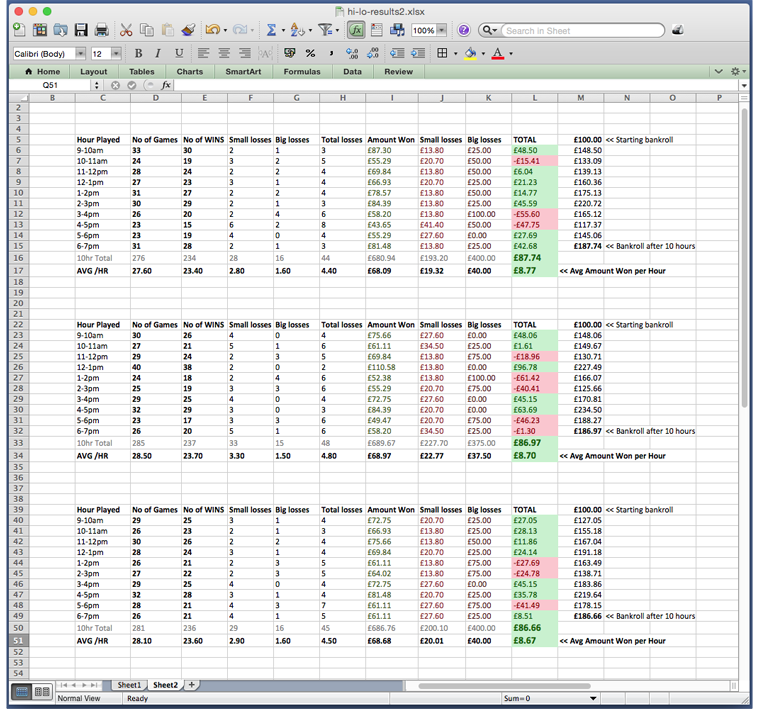 Below is a screenshot of a spreadsheet we used to record 3 separate marathon 10-hour testing periods, to really put this system through its paces. PLEASE NOTE: We DO NOT intend for you to use Turbo5 in this way – it’s meant to be used in short sessions for FAST easy wins. But we had to test it like this to PROVE it can also make profits over a longer session, potentially long term. Rows 17, 34 and 51 contain the averages PER HOUR. As you can see, it’s amazing how similar the results are, for 10-hour continuous sessions over 3 different days. And what’s even more amazing is the average amount won per hour is £8.70. We counted a single win as £3, small losses as under £7 and a big loss was exactly £25. Despite some losing hours (in red), if you keep betting, you recover those completely and never even go below the £100 you started with. See the running totals in column M.
These are real numbers taken from genuine game data from Betfair. We can see, Turbo Hi-Lo averages 28 games per hour. Using our system we won on average, 23.5 out of those 28 games EVER HOUR. Each time we started with £100, and ended up with around £187.00 after 10-hours. After the first 10-hour period, to check this wasn’t a fluke, we did it again, and again! ALL THREE TIMES IT MADE A PROFIT! That’s 30 hours betting, and overall the system produced a profit. Pretty impressive!! NOTE: If the spreadsheet above is confusing or doesn’t make much sense, please do not worry – you will not be betting like this in hourly periods. You will be following our easy Betting Chart, betting in short sessions (not like the above!). You can start with just £100.00 GBP (or whatever your currency is USD, EUR, AUS…) in your starting bank. With THIS system a large bankroll is not needed because we’re only placing SMALL bets each time, and our session target and stop loss are low. With £100 in the bank, we’d be aiming for £5.82 profit from each winning session. And losing a large amount in a single game if things go wrong. None of the above are a problem with Turbo5. We only place small bets, we only bet at the start of a game (not during), you cannot possibly lose more than £25 in a single game, and you only lose £11.64 if you lose a session (this will make perfect sense when you read the manual). 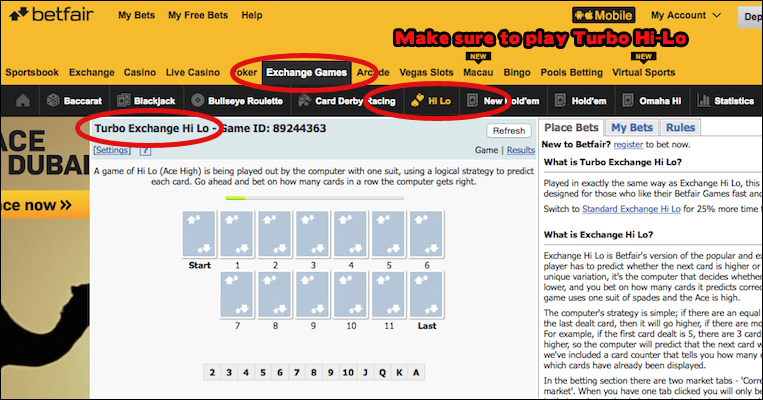 Please note: You can ONLY use this system at BETFAIR.com using their TURBO HI-LO game. You cannot use this system anywhere else. Having said that, this is NOT a complicated system, it’s VERY SIMPLE to learn and EASY TO FOLLOW. QUESTION: Do I HAVE to use Betfair? ANSWER: YES – its designed for Betfair only. QUESTION: Do I have to play Turbo Hi-Lo specifically? ANSWER: YES – this is very important. QUESTION: Why can’t I play Standard Hi-Lo with this system? ANSWER: Because it probably won’t be profitable. The games are different. When we ran this system over a 30-hour trial on Standard Hi-Lo, it averaged a small loss every hour. With Turbo Hi-Lo, it averaged £8.70 profit per hour. QUESTION: Can I double the bets to try and win more than £5.82 per session? ANSWER: Yes, you could do this. However, we recommend sticking to the system because small wins are always matched and don’t attract attention. QUESTION: I own a bot, can I program my bot to place the bets for me? ANSWER: It’s possible, but according to Betfair they do not allow the use of bots – so this would be entirely at your own risk, and we cannot advise you to do this. QUESTION: I’ve seen a Hi-Lo game on another website – can I use Turbo5 with it? ANSWER: No, this is specifically made for Betfair Turbo Hi-Lo. QUESTION: What will I be betting on? ANSWER: This is explained in the system. You are betting on something that occurs very often in Turbo Hi-Lo and therefore you will have lots of easy winning sessions. QUESTION: What type of BANKROLL do I need to start with? ANSWER: A minimum of £100. Anything over that is also fine. QUESTION: How much will I have to stake for each bet? ANSWER: You will be risking no more than £25 in a single game. It’s impossible to lose anymore than £25 in any one game. QUESTION: Will I have enough time to place my bets? ANSWER: YES – you only place a couple of small bets at the start of a new game. No bets are placed during the game so you don’t need to worry about not having enough time. QUESTION: What if this is too complicated for me to understand? QUESTION: Can I use Turbo5 long term? ANSWER: If you mean will Turbo5 still be useable in the months and years ahead, then Yes. But remember, this is designed to be used in short sessions. That is the key to making money from Betfair Games. Betting non-stop for hours and days on every game can only ever produce a small profit, break even, or lose money. This is because the games balance themselves out to ensure they conform to the rules of probability – and the odds offered ensure this. So, once again, the only way to win is in short sessions. QUESTION: Can I use Turbo5 with auto-betting software, run it 24/7 and win constantly? ANSWER: Sorry but no, probably not. It’s a waste of time trying to even do that with Betfair Games because the system you’re looking for doesn’t exist. If it did, it would cost you a fortune and it wouldn’t work once other people found out about it. The ONLY WAY to profit consistently from these games is SHORT TERM, in and out. Like going up to an ATM, collecting your money and walking away. This is what Turbo5 does. QUESTION: If lots of people are using the same system, will that affect the game? ANSWER: No it shouldn’t. Betfair are known to ‘seed’ each market with money so there should be enough money for everyone to place their bets. You don’t’ tend to ever see ZERO money available in a market. Also, not everyone will be playing at the same time. QUESTION: What happens if I don’t receive my download link by email? ANSWER: You should receive an email within a few minutes after ordering containing a download link to get your product. If not, your download link will also be available in your Order History inside Your Account on our website. QUESTION: What happens if I need HELP? ANSWER: If you have any questions you can Contact Us and we’ll reply and help you right away (usually within a few hours). QUESTION: Can I ORDER on a mobile device (iPhone/iPad)? ANSWER: YES, you can place your order on a mobile device BUT you must download the actual product to a PC or MAC computer (desktop or laptop). After ordering on your mobile device, you’ll receive a download link by email – so just check your email on your PC or MAC and click your download link to get your product. QUESTION: Can I DOWNLOAD the product on a mobile device (iPhone/iPad)? ANSWER: NO, you must download the product to a PC or MAC computer (desktop or laptop). You can ORDER on your phone or tablet, and after ordering on your mobile device, you’ll receive a download link by email – so just check your email on your PC or MAC and click your download link to get your product. Able to Play Turbo Hi-Lo game HERE. This system is a bit slow in terms of winning large amounts, but it does work. I know the aim is to make nearly £6.00 a time quickly, but I was hoping I could bet a lot more each time and win more quickly. When I stick to the system exactly as laid out, I must say it does perform well. Congrats on that. It’s just a shame I can’t make £50 or £100 each time like I can with some of your other systems. The turbo game is fast but the profits take a while to come in. I really like this system because I was able to produce a set of rules for my bot based on the method. I know FlamingTorch don’t offer support with using bots, but i’m happy to report it wasn’t too hard for me to do this on my own and i’m seeing a steady stream of profits coming in. Sometimes it can go over an hour hovering around break even, and sometimes it can make £30 or £40 in under an hour. I’m glad i’m using a bot because I can’t sit in front of the computer for long as I get bored quickly. If you’re happy with £5.00 profits made quickly, then this system would be perfect for you. ★★★★☆ Thank you for this! This is a refreshingly solid betting system, designed for one of my favourite Betfair Games. It’s very easy to follow and it does work (which is the important part!). I like Turbo Hi-Lo because it’s quick. Unfortunately I can’t give the system 5 stars because you have to use it on a computer with a mouse. It’s no good on my ipad because I can’t place the bets quickly enough. I guess on a laptop you’d be ok, but I find I need to use a mouse to quickly place the bets in time. If you could play multiple games at once to speed the sessions up that would be ideal. But for casual betting in sessions under 20 minutes, it’s pretty decent! USE BETFAIR AS A VIRTUAL ATM BY PLAYING TURBO HI-LO WITH OUR TURBO5 SYSTEM TODAY! GET IT NOW! Download your copy of our Turbo5 System today and DISCOVER how easy profits can be made on Betfair with our easy to follow Instructional Videos & Manual. Click the Add to Cart button below.